With all the zucchini cleared out of the fridge for the first time in weeks it's time to move on to the eggplant. We received three more eggplant (eggplants?) this Monday and with one left from last week we're officially a week behind. Tonight was time to snap into action and start putting some eggplant to use. Eggplants to use? What is the plural of eggplant anyway? 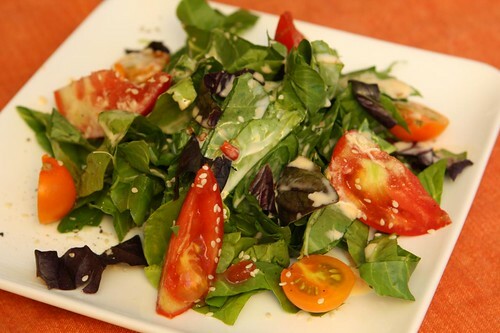 I washed the farm spinach about thirty-five times before making this salad with spinach, farm tomatoes, and some torn leaves of opal basil. The salad was topped with this creamy sweet chili dressing which bares a striking resemblance to last night's dipping sauce for the fried okra. Maybe because I just added a little more sweet chili sauce, soy sauce, and rice wine vinegar to thin it out before drizzling it on the spinach and sprinkling with sesame seeds. Twice a year (approximately) I like to break out the wok. Since it gets so little use it essentially looks as it did when it was brand new. 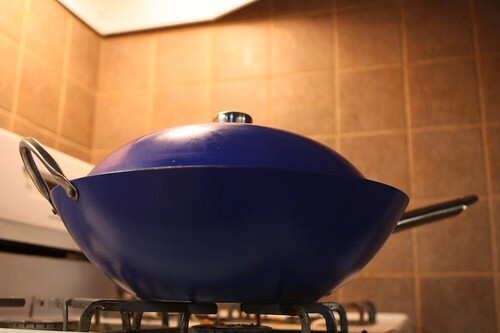 Since I purchased one for Jen as a gift and a second for myself before we moved in together we will be using this model wok easily for the rest of our lives. 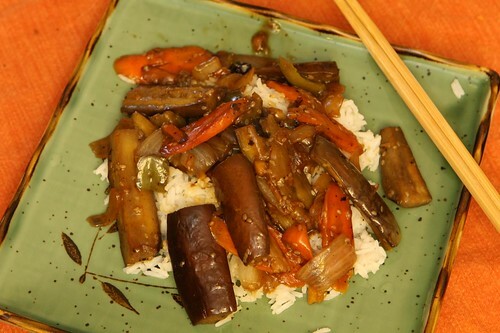 In the wok I heated some canola and sesame oil and toasted some slices of the farm eggplant. After removing it from the pan I toasted some crushed garlic, sesame seeds, and diced ginger. After a minute I threw in some of the farm Wala Wala onions, sliced carrot, farm green peppers, and then returned the eggplant. At the end I finished it off with a sauce of soy, rice vinegar, and cornstarch. I served the dish over plain white rice with torn opal basil leaves. I also used a square plate to accentuate its exotic ethnic nature. 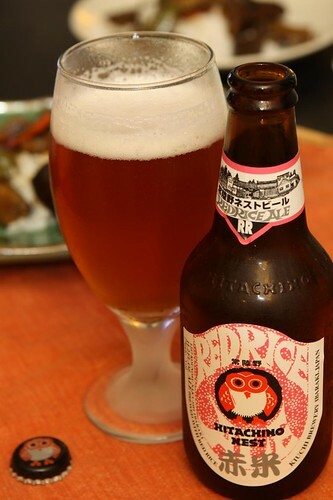 As an accompaniment to tonight's pseudo-Asian meal I poured this Hitachino Nest Red Rice Ale from Kiuchi Brewery in Japan. This was a pretty tasty beer and it featured a cartoon owl which is a pretty nice feature for a beer. Not enough beers feature cartoon owls these days. It's this younger generation. They have no appreciation for a cartoon owl.